Each CodeCharge Studio project requires certain parameters to generate the proper programming code. Here you specify the general project parameters. 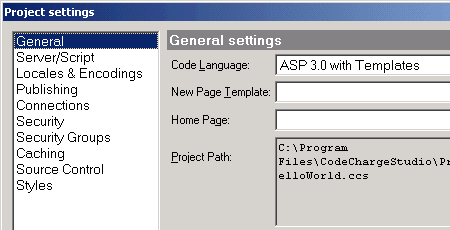 ASP 3.0 with Templates: Generates ASP 3.0 (VBScript) programs that use separate .html files as templates during run-time. ASP.Net C#: Generates .aspx files with C# code. ASP.Net VB: Generates .aspx files with VB code. CFML 4.0.1/MX: Generates ColdFusion 4.0.1 code. CFML 4.0.1/MX with Templates: Generates ColdFusion 4.0.1 code (.cfm) and separate .html template files. JSP 1.1 JDK 1.3: Generates JSP 1.1 code. PERL 5.0 with Templates: Generates PERL 5.0 code and separate .html template files. PHP4/PHP5 with Templates: Generates PHP code (.php) and separate .html template files. Servlets 2.2 JDK 1.3 with Templates: Generates Java Servlet code that utilizes .html templates. Specifies the main page of your web application, which you can later launch with the F7 key or from the menu with Project | Home Page. The specified home page will then be generated, published, and opened within CodeCharge Studio in Live Page mode. Specifies the current location of the project and its file name. This is for informational purposes and cannot be edited from this dialog.